Who are the women leading Central Florida’s business community? With a significant portion of the greater Orlando market belonging to women-owned businesses, female business leaders impact the area daily. The May 2015 edition of i4 Business®, Central Florida’s premier business publication, will focus on “Women of Excellence,” and will include a special marketing section spotlighting the achievements and offerings of women-owned businesses and business leaders throughout the Central Florida region. This invaluable marketing tool will highlight many of the top female-driven businesses and business leaders in Central Florida through comprehensive, full-gloss, color profiles included in the print and digital magazine, published online at i4Biz.com and promoted through i4 Business‘ active social media extensions. Our digital tools help promote your brand digitally and expand your reach. The i4 Business digital edition offers the opportunity to maximize your profile by including website links and video. See samples of Women in Business profiles here. CONTACT YOUR I4 BUSINESS REPRESENTATIVE TODAY! Note: Each professional profile will appear in a specific, cohesive format designed by SCB Marketing. One proof will be provided to review and make necessary corrections prior to publication. * If a professional, high-resolution photo cannot be provided, the participant can opt to have his or her portrait taken at SCB Marketing’s office studio for no additional charge or the participant can request an SCB Marketing contracted photographer to take their photo at the location of their choosing for an additional $200 travel and set-up fee. Images with three or more individuals may not work with the formatted design of the profile. Complimentary images include up to three individuals; larger groups will receive an additional photography charge. All images will remain the property of SCB Marketing. 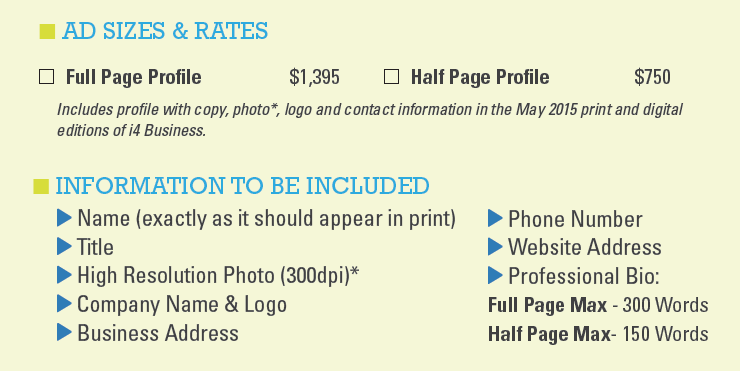 Images may be purchased for an additional fee.